OK, I have not posted for a number of days and that is because I have been busy at the Miami show and back at the boat. The day before the show we had installed the top down furling system as well as the updated non-torsion leech rope on the screecher sail only to find that there was a system at the show (The Profurl Spinex system) that we liked very much because it solved some issues. The system has a number of rotating balls that is much kinder to the sail. Experience has shown that winding a gennaker around a thin rope is not that kind. Seldon, the inventors of top down furling, had developed a foam core around the rope but this ball system seems a lot more attractive. The balls also prevent back furls and make the initial furling faster. I can now use the one Karver furling drum for both my screecher and gennaker – no threading of the reefing line around a new drum, no having to remove soft shackles that can easily blow away …. all I do now is simply unclip a single captive pin and put on the new sail – a single click operation to change sail. That is possible because the Profurl system has the top down tuning swivel separate from the furling drum. The safety of the Karver locking drum that auto locks to prevent unfurling. A kinder system for the gennaker with the Spinex balls. 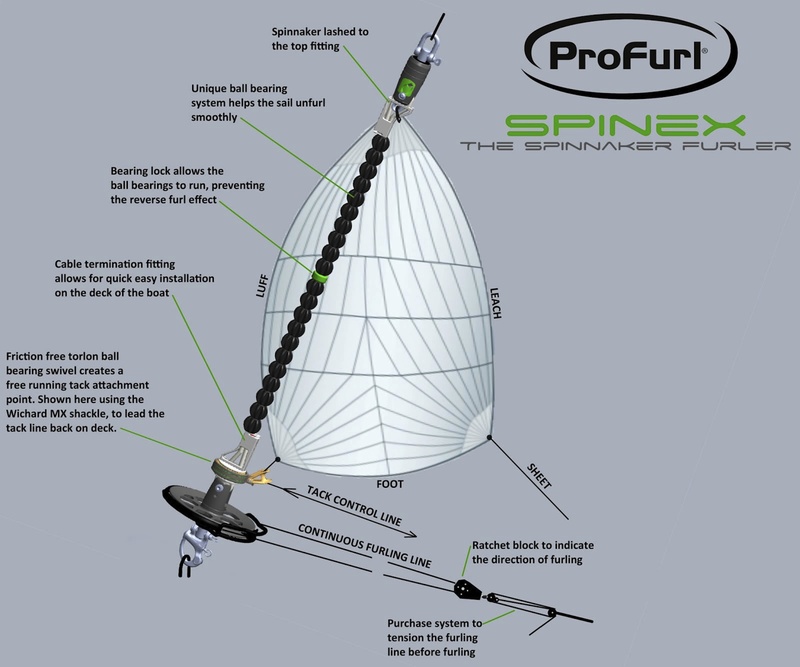 A Spinex system to prevent back furling. A single captive pin change over for screecher to gennaker and vice versa. I will leave my UV protected screecher up as the norm and just click in the gennaker as and when I need to. The ease of change over means that we will use the system a lot more and I have made it as simple as possible to cope with as we grow older. I have been shooting a video of this whole development that follows the twisted course I have been on. I will release it on the Multihulls4us.com forum as soon as it is edited. Aside from the furling saga, I have been polishing the boat now about 75% done and of course the biggest news of all is that Lesley may be here in under two weeks! She has had to endure a lot since we returned to the UK last July and is very much in need of some R&R. Of course there have been other jobs done over the last week as Suliere becomes the best boat she has ever been with so many mods done and so many issues solved. It sometimes takes time to do even the simplest job on a boat. The saloon fridge door would not catch at the bottom – you had to use your knee to make sure it closed. That involved emptying out a huge cockpit sail locker to prise off a plate to give access to the fridge drain tube – so I decided to fit an inspection port there to make any future access easier, then the fridge had to be removed to gain access to all the bolts …. in the end a job that lasted just over two days but is now ticked off the list. That is the nature of boats. Over the last 3 months we have never known when Lesley would be free to come over … its always been a few more weeks so the situation has always been an evolving one that we had little control over. The upside is that it has enabled us to get the boat very sorted and many planned mods done. This should make our cruising life a lot easier in the future. Sure things will go wrong as they always will on a boat but compared to the first three years of Suliere, any issues should be as nothing compared to the past. It is with some sadness that I look at newer St Francis 50’s only to see that they have the same issues just waiting to disrupt cursing life. Undersized blocks on the boom that have failed on three boats to my knowledge plus other issues I can spot with my now experienced eye. The relationship is such that I just walked pas the St Francis at the Miami Show. Well thats enough chatting for tonight …. nightie is when i get good bandwidth here at the marina so its a much easier time to use the computer.